Satellites are celestial bodies that share a orbital path with a larger or primary body. Such as Earth's Moon. These are typically smaller in size in comparison to its counterpart and does not meet fully with the criteria that would constitute it as a planet or primary object. Currently there are only 19 objects that fall under this category. Any natural object that orbits a primary object (like the Moon orbits the Earth) but does not meet the qualifications of a planet, dwarf planet, or satellite is considered a Moon. These objects are typically irregular in shape and are thought to have been asteroids at one time becoming caught in the gravitational pull of a "parent" object. Currently, there are 162 known moons in our solar system. Moon (Earth) — Earth's satellite, the Moon aka Luna, serves an important part of our planets oceanic systems determining their tides and currents. There have been several theories as to the formation of the moon. The most accepted theory suggest that a collision with another planetary body (Theia) by the Earth caused a large chunk of rock to be thrown upwards and caught in orbit by Earth's gravitational pull. Over time, its rotational speed gave it its current "spherical" appearance which classifies it as a satellite and not just a moon. Io (Jupiter) — is the closest satellite to Jupiter and the second smallest of the four Galilean Moons. Io has over 400 active volcanoes on its surface making its atmosphere both toxic (primarily sulfur dioxide) and very hot. The gases from these eruptions are projected into space and create a "ring" of particles around Jupiter called the Io Plasma Torus. Europa (Jupiter) — next in line would be the smallest of Jupiter's Galilean Moons is Europa. An ocean flows beneath the surface of this moon which is kept fluid by a warm interior due to its close orbit to Jupiter and has scientist believing that it may be capable of sustaining life. Missions to this moon by NASA and ESA for closer observations have been planned for sometime in 2020 but actually preparations have not begun. Mimas (Saturn) — has been nicknamed by some as the "Death Star" due to a large impression on its side causing the small satellite to have the appearance of the famous "Star Wars" icon. It's surface consist primarily of water ice and this appears to be the only element on the satellite that can be found. It is the smallest known body in space to be rounded by its own gravitation. 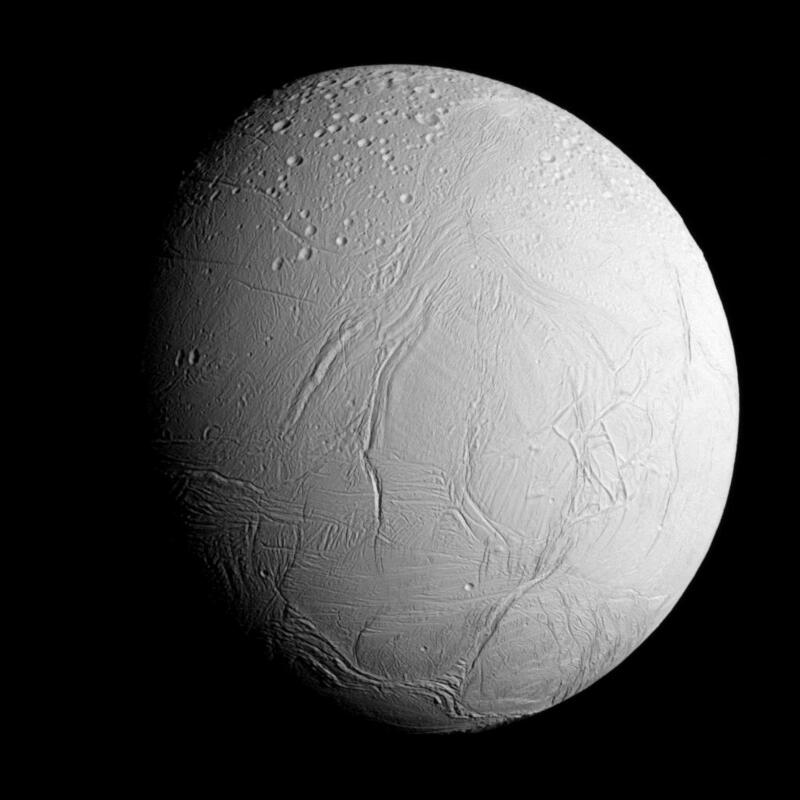 Enceladus (Saturn) — is the second satellite in Saturn's orbit. Beneath its surface is a subsurface ocean that ejects water vapor into the atmosphere. They believe this water vapor is what contributes to Saturn's "E-Ring". Above the surface, the satellite is covered in ice. In 2005 the Composite Infrared Spectrometer (CIRS) observed a heated area in the Southern polar region but after much debate scientist are still baffled as to what is causing it. Titan (Saturn) — a golden haze surrounds this interesting satellite given to its nitrogen-rich atmosphere. Titan is the only known non-planet to contain an actual atmosphere and is the only other body in our solar system to contain one aside from Earth. However, Titan's atmosphere is much denser then Earth's. In September of 2013, propene (an element found only on Earth and our moon) was detected by NASA's Cassini spacecraft. Iapetus (Saturn) — (eye-APP-eh-tuss), is the last of Saturn's satellites. It's Yin Yang of a leading hemisphere of a dark albedo (reflectivity) of 0.3 to 0.5 and its trailing hemisphere of a brighter albedo of 0.5 to 0.6. Around the equator of this satellite is a range of mountains making it look like two "helmets" put together. It is believed that Iapetus is, like Rhea, is three quarters ice and one quarter rock. Triton (Neptune) — of Neptune's 13 moons, only Triton qualified as a satellite. Triton has a retrograde rotation where it rotates in the opposite direction of its parent planet, it is the only known object in our solar system that does this. It is also the only known object to be currently geologically active at this current time which indicates that it is still relatively young.